On Wednesday, June 6, I attended the day-long review of the State Advocacy Pilot. About a year ago, three states were selected to participate in a social justice advocacy pilot. The goal of the pilot initiative was to build coalitions and implement advocacy programs in California, North Carolina and Michigan. The YWCA’s in California took on the broad issue of the criminalization of people of color specifically racial profiling, immigrant surveillance, mass deportation, immigrant enforcement raids, etc. They targeted legislative initiatives at the state and federal levels. North Carolina focused on racial profiling by mandating training, transparency and accountability for law enforcement. Their strategy involved building relationships and public support for state level anti-discrimination efforts, revising use-of-force policies to teach de-escalation tactics, implicit bias training, and addressing traffic stop disparities disproportionately affecting people of color. Michigan’s pilot the disproportionate disciplinary outcomes of youth of color in schools and the community by promoting equitable policies and mandating training for school officials and law enforcement. They also targeted state laws that needed to be strengthened. At the kickoff plenary session on Thursday, CEO Alejandra Castillo spoke about her path from the Obama administration Department of Commerce to the position of YWCA CEO. She talked about refocusing the organization’s mission on social justice and engaging our collective power to impact change in our communities. The most exciting part of the opening session was a presentation by the CEO of the Chicago YWCA, Dorri McWhorter. She described a financial initiative where the YWCA is Partnering with a not-for-profit company, “Impact Shares”, to create an ETF (Exchange Traded Fund) called “WOMN”. The fund will invest in companies that meet 20 specific social action criteria such as number of women and POC’s on their boards and in their executive ranks. I cannot WAIT until I can invest a part of my portfolio in this mutual fund! The first breakout session focused on voter registration and provided a roadmap for an effective voter registration and engagement strategy. I also learned that the YWCA USA has a get out the vote initiative that we can sign up for. I will investigate this further. The second session of the day provided us with strategies for making progress with conservative decision makers. The gist of the advice was to engage regularly, in person when at all possible, and try to find common ground on issues and legislation. The evening featured a gala dinner at the historic Majestic Theater, a beautiful venue filled with YWCA association staff and board members. Hearing from Alejandra Castillo, a local City Council Woman, Rebecca J. Viagran, and the keynote speaker, Amanda Seales an activist and actress on the HBO television series Insecure was merely the beginning of an evening of pleasant surprises. After the speakers concluded, the curtain was lifted on stage to reveal the festively decorated tables we would be having dinner at! Networking and celebrating 160 years of Eliminating Racism and Empowering Women, the evening ended with a gift commemorating the anniversary. The next morning’s plenary session featured a panel discussion with three leaders from organizations who are addressing the serious social justice issues facing our society today: gun violence, immigration policy and the treatment of “brown” immigrants, and racial profiling. The organizations represented were: ACLU, Crittenton Foundation and Everytown for Gun Violence. The opening keynote focused on “Impact Investing”. The breakout session I attended focused on social impact investing. This session addressed the issue from two perspectives: investing YWCA endowment funds in socially-conscious funds and finding investors who are willing to invest in the YWCA with the expectation of a return as some point. There are several states that offer this kind of investment vehicle, similar to a bond. I do not believe Arizona is one of those states. 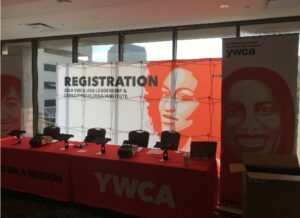 In total, the YWCA Leadership and Capacity Building Initiative Conference was very inspiring and well worth the time and effort. 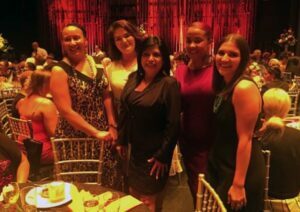 I am sure that the four of us who attended from the YWCA of Metropolitan Phoenix will be able to take what we learned and apply it to benefit the communities we serve.